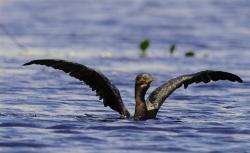 Cormorant’s deep-dive-video footage amazes researchers. This shaky video captured off the coast of Argentina shows the South American shag diving 150 feet to the ocean floor in 40 seconds, then spending 80 seconds exploring for food, before finding a fish and swimming back to the surface to gobble it up. The footage wowed researchers at the Wildlife Conservation Society, which has been tracking over 400 of the birds for a decade in hopes of identifying priority feeding areas they can help to protect. New video footage from a camera strapped to the back of an imperial cormorant shows the incredible journey of the birds as they dive 150 feet below the ocean to look for food.